This gorgeous White Freshwater Pearl Necklace is a must in every jewelry box. This 7.5-8.5mm necklace will be used on a regular basis for your casual, business and or formal attire needs. The slightly out of round shape give it the distinct character so no two pearls are ever alike. The near perfect luster and 100% nacre add value. Each pearl is hand strung on a fine double knotted silk thread, and separated with a hand tied double knot to ensure that shape or luster are preserved. TOP QUALITY PEARL: Our pearl experts hand-pick only the highest quality freshwater cultured pearls for our jewelry. 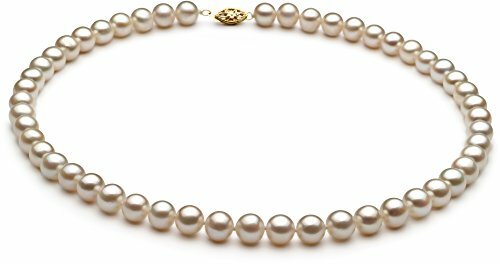 This necklace features a premium AA-grade genuine freshwater cultured pearl measuring between 7.5 to 8.5mm. The AA is a perfect sweet spot for quality and price. This pearl has very good luster and nearly round shape - that makes this necklace even more rare and precious.